Michelle Grubb-Solaimani, CFO, W.O. Grubb, and Andrew Longacre, regional business manager — Northeast, Terex Cranes. W.O. Grubb Crane Rental recently took delivery of a Demag AC 500-8 all terrain crane. 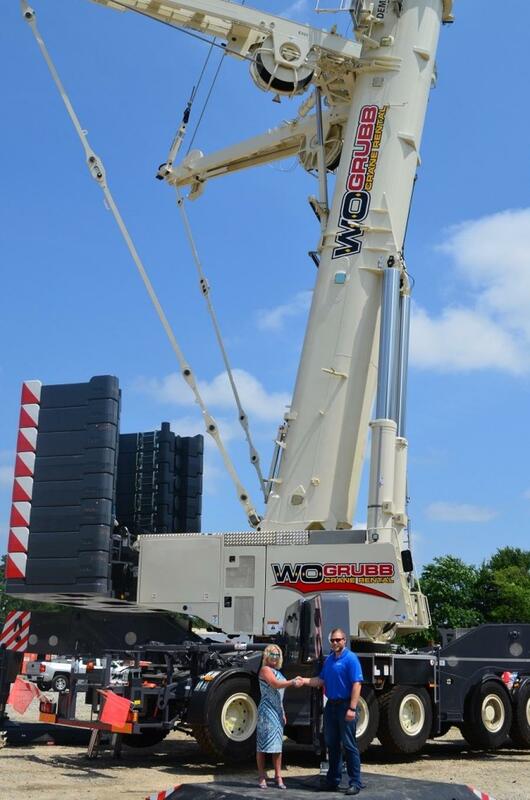 The eight-axle, 600 ton (500 t) lift capacity crane features the maximum system length of 478.3 ft. (145.8 m) and the Demag IC-1 Plus control system designed to provide the crane's maximum allowable lifting capacity, based on the slewing angle, for every crane configuration. The Demag AC 500-8 all terrain crane has the shortest carrier length of its class and x-pattern outriggers that are designed to provide on-the-job stability. The crane also comes with the Demag sideways superlift (SSL) for a superior lifting performance, according to the manufacturer. Found in the 1960s, W.O. Grubb Crane Rental has 111 rental locations throughout Virginia, Maryland, North Carolina and Pennsylvania. The W.O. Grubb rental fleet is the largest in the Mid-Atlantic region, and ranked as the 9th largest crane owning company in North America by American Cranes & Transport Magazine. For more information on W.O. Grubb, call 804/271-2539 or visit visit http://www.wogrubb.com. Terex Corporation is a global manufacturer of lifting and material processing products and services delivering lifecycle solutions that maximize customer return on investment. Major Terex brands include Terex, Genie, Powerscreen and Demag. Terex solutions serve a broad range of industries, including construction, infrastructure, manufacturing, shipping, transportation, refining, energy, utilities, quarrying and mining. Terex offers financial products and services to assist in the acquisition of Terex equipment through Terex Financial Services. For more information on Terex, visit www.Terex.com.